If you regularly get involved with woodworking and want to spend a bit more for a top-of-the-range orbital sander, this powerful Bosch model is ideal. It includes a 3.3-amp motor, a 6-inch disc and has a larger speed range from 5,500 to 12,000 orbits per minute. For those looking for an orbital sander for infrequent use and household tasks, the Black+Decker BDERO100 is a great budget option. It’s a little less versatile but it’s ideal for smaller tasks and includes an easy-to-hold rubberized handle for comfortable use. The shorter height and spin range of between 8,000 and 12,000 orbits per minute makes the DeWalt sander a great piece for getting closer to your work piece. It has a counterweight design that makes it comfortable to use, reducing vibration and improving user fatigue. So many DIY tasks require the addition of a bit of sanding but sanding by hand (particularly for larger jobs) can get old very quickly and takes masses of time. Whether you’re regularly carrying out woodworking tasks around the home or you just want a smaller sander for simpler jobs here and there, having a random orbital sander on hand makes the process much easier. Random orbital sanders are hand-held tool which deliver quick and efficient sanding action by simultaneously spinning the sanding disc and moving it in small ellipses for a smoother result. These tools use sandpaper discs and many of the models on the market also include integrated dust collectors for easy clean up. Most models have a cord, although some are cordless for ease of movement, so you’ll likely need to work close to a power supply when using an orbital sander. Though rarer, there are also air-powered designs on the market too which are famed for their durability. Understanding your needs before you start shopping around will make the decision-making process easier and ensure you get the right product for your requirements. If you’re serious about your woodworking craft, there’s no denying that having an orbital sander in your toolkit is hugely beneficial. The following random orbital sanders are some of the most innovative and easy to use you can buy, to help you achieve your best work and the smoothest finish. Here are ten of the best random orbital sanders to meet your needs, whether you’re a DIY pro or a woodworking hobbyist. The Bosch ROS65VC-6 Rear-Handle Random Orbit Sander is a powerful and high-end sander that provides plenty of versatility and features. The 3.3-amp motor provides variable speeds and there’s a choice of a 5-inch or 6-inch disc. The Bosch model has a die-cast aluminium design and a dust-trapping filter that’s in-built to grab the dust from smaller jobs. If you’re carrying out bigger tasks, there’s also a vacuum hose adapter. While this model is heavier than some others, which is worth noting if you’re doing a lot of overhead work, it has excellent vibration control and features a trigger lock to let the sander run without you needing to hold down any buttons. 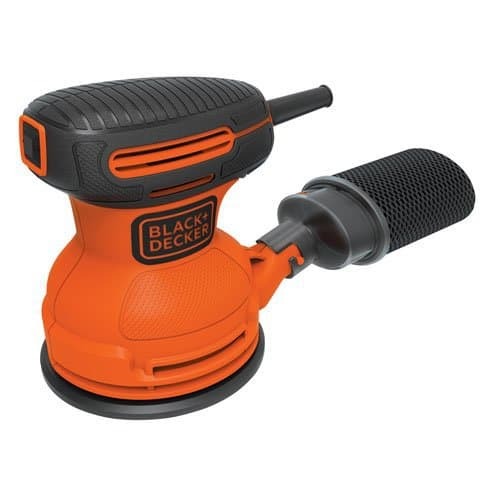 The Black+Decker BDERO100 Random Orbital Sander is perfectly suited to light or infrequent tasks where you don’t need anything too powerful but still want good quality for your money. It features a five-inch disc but a slightly less powerful motor than other brands, with a 2-amp motor. The sanding speed on this model is fixed at 12,000 orbits per minute. For a product at the lower end of the budget scale, the BDERO100 does a great job and is great for simpler tasks around the house. It includes a dust-sealed switch, so dirt and grime won’t get into the tool and the dust canister does a brilliant job of collecting dust from different jobs. If being tethered to cables makes you feel limited in what you can do, the Makita XOB01Z model is the orbital sander for you. This cordless tool is powered by a rechargeable 10-volt lithium ion battery, so you can work anywhere without needing to set up camp near a power outlet. You’ll get around 20 minutes of use from the sander on high speed and 40 minutes on low speed, which is usually enough for even the most in-depth of sanding jobs. In addition to being cordless, the XOB01Z model is also lightweight, weighing just 3.6 pounds, which is ideal if you’re using it for a lot of jobs. The Ingersoll-Rand 328B Air Geared Orbital Sander is the perfect choice for heavy-duty sanding and large workloads. The 8-inch pad gets through large jobs quickly and the ball-bearing construction makes this a comfortable model to use. This sander is built to last so it’s a great investment if you’ve got an air compressor or are willing to make the investment to get one. The low vibrations make it easy to use – it has an ergonomic design to fit your hand perfectly and it also features a lever throttle to take the pressure off your palm. This sander is great for precision jobs that enables you to achieve your best work. Whatever the task, the SKIL 7492-02 Random Orbital Sander is the perfect tool for the job that’s great for hobbyists and larger home improvements alike. The clear view dust canister takes the guess work out of when you need to empty the canister after completing a job, while the micro-filtration system picks up finer dust particles for cleaner tasks. The SKIL sander has random orbital action for a swirl-free result that’s coupled with a pad brake to avoid any gouging to the surface of the wood. Last but not least, the sander has a pressure control indicator, so you know exactly how much pressure is too much for the task at hand. This ensures the best result for whatever project you’re working on. The DeWalt DWE6423K Random Orbit Sander features a hook and look pad design and delivers between 8,000 and 12,000 orbits per minute, with reduced vibrations for comfortable sanding. The low-profile design and rubberized grip make this an easy sander to use, even for larger woodworking jobs. 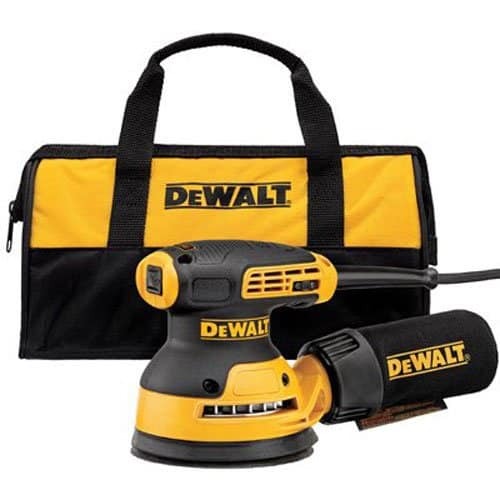 The DeWalt sander has an improved dust-collection system and a one-handed locking bag for ease of use when you’re in the middle of a task, but if you want to attach the dust port to another vacuum system this model fits with a 1-1/4 inch hose. The Festool RO150 Rotex sander is a heavy-duty and powerful tool that’s capable of tackling even the most refined of woodworking tasks. If you don’t want to switch up between different tools, this Rotex sander is the perfect choice as it features dual mode sanding that can switch easily between rough and fine sanding, for maximum flexibility. It has a jetstream dust extraction system to quickly eradicate dust from the work area as fast as the sander produces it, and the pad changing system is simple to do so you can get through each task efficiently and with minimal clean up at the end. 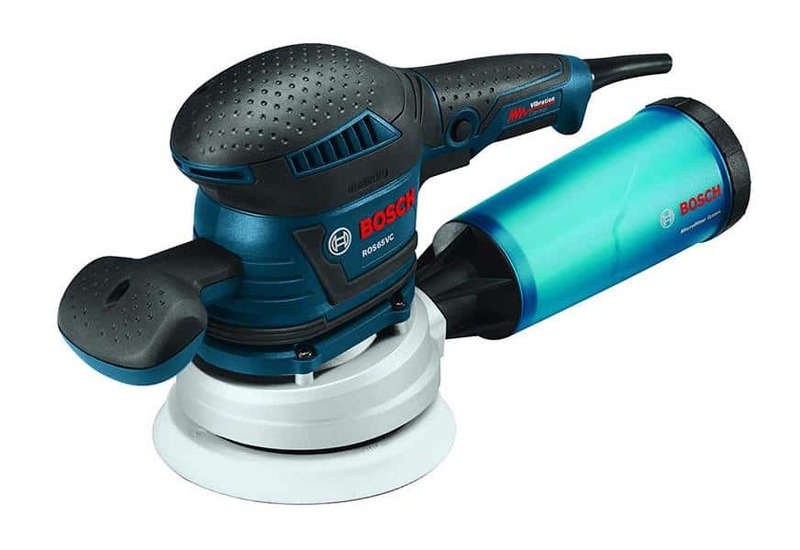 The Bosch 1250DEVS Random Orbital Sander and Polisher stands out from the rest of the Bosch range for its ability to switch between two unique sanding modes and be adjusted easily. All that’s needed is a simple flip of a lever and the sanding mode can be changed. This functionality means you can take on a variety of tasks efficiently, whether you’re smoothing out finer details or taking down heavier stock. It has a soft start function and pad dampening system that helps to reduce the swirl and scuff marks that some sanders cause, leaving a perfect finish every time. A great low-cost orbital sander, the Porter-Cable 382 has an ergonomic design and built-in dust collection system which can be replaced with an adapter if you want to hook it up to a vacuum system. The power in the 382 doesn’t make it suitable for heavy-duty jobs but it’s ideal for lighter tasks and smaller household or fine finishing jobs. The benefit of this model is that’s it’s incredibly lightweight and easy to move around, as well as being compact for storing for future use, so there’s no risk of user fatigue. The Makita BO5041K Random Orbit Sander offers excellent performance and functionality, with premium quality details and construction. It has a 3-amp motor for variable speed control and the two-finger trigger also has a lock-on mode for complete comfort when using. The BO5041K has a high-capacity dust collection process and a built-in shop-vacuum adapter for versatility, as well as a removable front handle so you can switch easily between two-handed or one-handed operation. One of the main benefits of this tool in particular is that the larger 1/8-inch orbital action reduces the risk of swirls for a professional, smooth finish. What’s more, the kit comes enclosed in a durable case for easy transportation and storage.